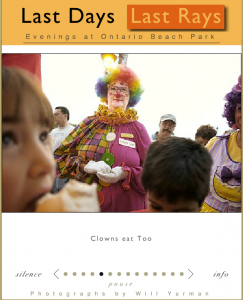 “Last Days, Last Rays: Evenings at Ontario Beach Park” published by the Rochester Democrat and Chronicle is structured so that the user can either watch the slideshow straight through, with or without audio, as well as turn captions and sound on and off. Each image is perfectly timed with a single audio clip that matches its content. This entry was posted on Thursday, January 19th, 2012 at 1:31 pm and is filed under MULTIMEDIA EXAMPLES, PHOTOJOURNALISM. You can follow any responses to this entry through the RSS 2.0 feed. You can leave a response, or trackback from your own site.